A U.S. Marine Corps veteran recovered from an illness to fulfill his goal of being the “something blue” at his niece’s wedding in Missouri. Bill Lee Eblen, 92, was a sergeant in the Marine Corps during WWII and a veteran of the Korean War, according to a Facebook post submitted by Alison Ferrell, Eblen’s niece. Eblen was recovering from pneumonia and was not certain he would make it to Alison and Matthew Ferrell’s wedding in Cape Girardeau. “I said ‘I’m 92-years-old this is a miracle happening to me!’” Eblen told KFVS. 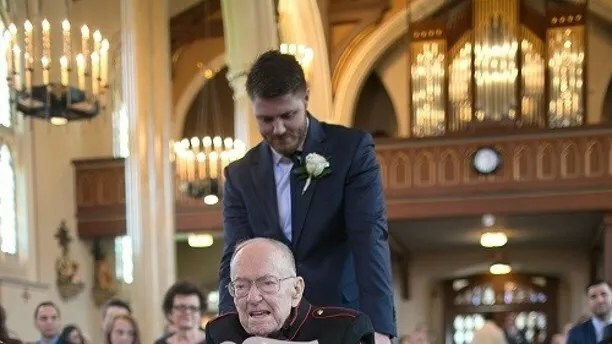 Bill Lee Eblen, 92, was wheeled down the aisle of his niece’s wedding in Cape Girardeau, Missouri, after recovering from an illness.